Sammy-D21 V1.0 is a versatile and very compact/small (just 18x38mm size!) 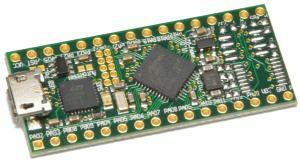 microcontroller board with the SAMD21G18A microcontroller and CP2102 USB UART converter. All relevant controller signals are available on pin headers. 16MHz XTAL and 32768Hz TOSC watch crystal are included. New: The Sammy-D21 can be ordered with preloaded chip45bootSAM Bootloader. With the free chip45bootSAM Windows GUI the application (hex file) can be uploaded through USB. No additional programming tool is necessary.